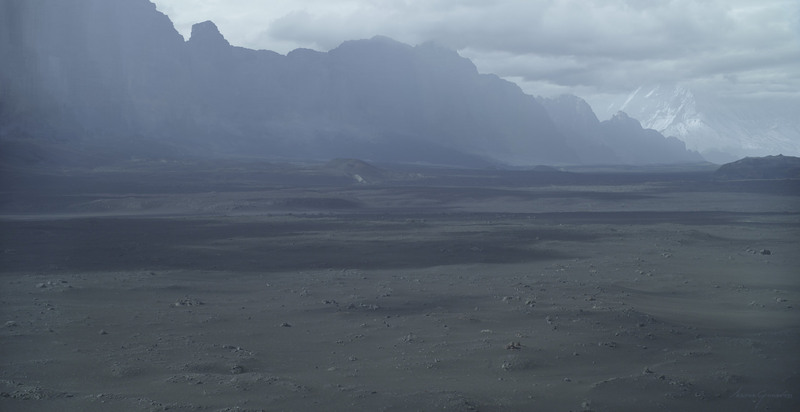 Prometheus has been the show in which Ridley Scott came back to the Sci-Fi genre after delivering master pieces such as Blade Runner and Alien. Hence everyone involved was determined to make a new masterpiece and I rarely saw the same amount of excitement and drive. 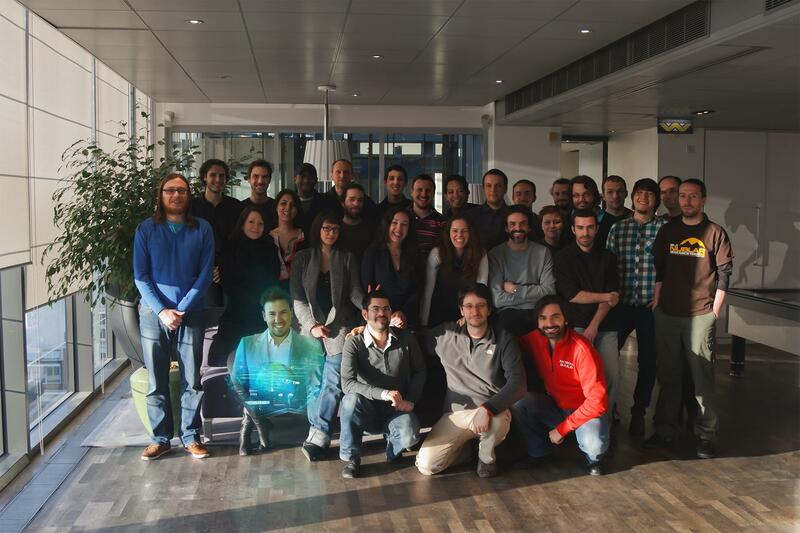 We also felt that the project was a unique opportunity to contribute to the Alien universe, so we didn’t spare energy. We constantly pushed for the extra mile and I believe the effort and enthusiasm is somehow visible in the final shots. My involvement with the show started quite early with a couple of test shots to research the look of the planet. However I was also required to help with a few other tasks, but after joining “Wrath of the Titans” I came back to contribute to the sequence in which the Prometheus spaceship approaches the LV-233 planet. At that time these shots benefited already from a few weeks of look development by a small pool of very talented DMP artists, led by Marco Rolandi under the supervision of Charley Henley and Richard Stammers. LV-233 planet surface // Concept. My first involvement with the show was an animated concept to research the look of the alien planet surface, which was made before the locations were decided and the shooting was even planned. The shot featured also a small Prometheus ship slowly entering the gate of the valley were the Engineers installed their “Pyramids”. LV-233 stratosphere // DMP before compositing. When the show started just a few artist were assigned to the landing sequence. They were quickly sketching ideas to explore different options trying to define the main features of the planet. Isabelle Rousselle, Sean Samuels and Piotr Swigut under Marco Rolandi’s guidance produced a number of concepts and mock-ups. When I rejoined the show some of these were approved and it was time to translate them into final shots. On this particular one I started from and excellent Mock-up made by Piotr. I particularly liked working on this matte painting because I believed it was one of the very few opportunities in which we could have made a really graphic, visually simple and yet striking image. So, I took the liberty to remove or add a few clouds to make this even more obvious in the composition. I started rebuilding it from the ground up using a few hi-res photos from our image library and painting some of the clouds by hand when necessary, trying to achieve the sharpness and consistency required by the final product. I was also taking care of splitting the clouds into different layers to be projected onto different objects. Each one of these layers where created with three different light intensities which were then provided to Dave Bowman (sequence compositing lead) to animate the light cast by the star rising behind the “Gas Giant”. 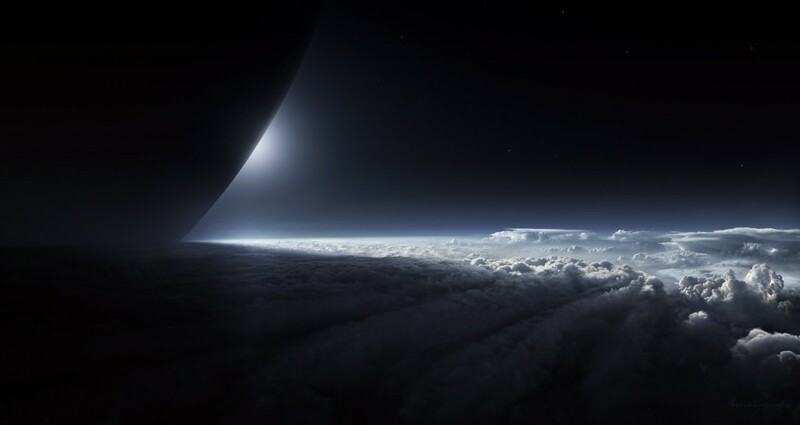 LV-233 stratosphere // A detail of the DMP showing different lighting conditions for one of the clouds layers. LV-233 stratosphere // A detail of the DMP showing different frames of the lightnings which were painted in Photoshop and animated in Nuke. The compositor was also using a few grid warp nodes to add subtle movements to the clouds. LV-233 stratosphere // A detail of the COMP with the “Auroras” added. Another interesting feature of the moon LV-233 are the electrical arches which disperse their charge from the cloud layer toward the outer space. We called them Auroras and the setup was based onto stripes of polygons which Michael Havart generated and animated in Maya through a procedural script. Once these objects were exported in Nuke we textured them with a series of animated shapes blended together to convey an organic movement and a sense of scale. Once these were rendered Dave processed them further at COMP stage adding some more blending with the atmospheric layers. Hurricane on LV-233 // DMP before compositing. One of the initial ideas for the alien planet, was to have a storm happening every time there was the transition between day and night. This was an important story point. So, it seemed quite important to picture the huge storm at the beginning of the landing sequence. Luckily, this was another shot for which Isabelle did a great mock-up for me to start from. I just had to rebuild the matte painting starting from some of the elements she had already selected, replacing the few that weren’t working too well and then finish everything with a little painting. 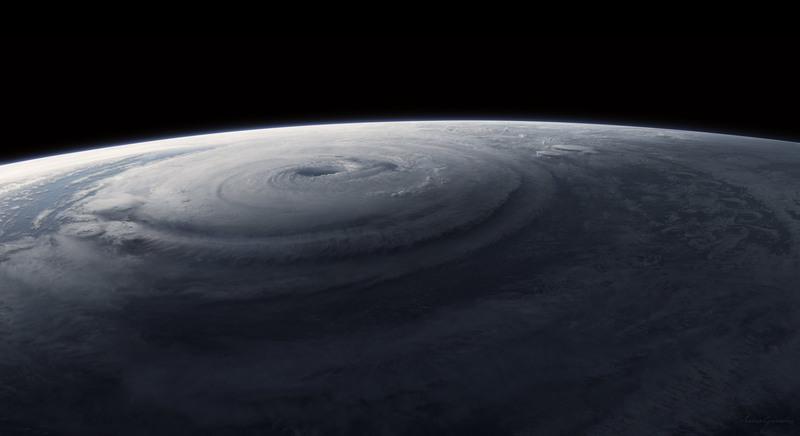 Given the slow and constant camera movement of the shot, we felt the need to simulate the subtle rotation of the hurricane as well as the parallax due to its depth and volume, so I built the DMP already split in about a dozen of layers which I have then projected onto objects modelled according to the DMP and animated with a deformer in Maya. The shot was composited by Kai Woytke which animated the lightnings that I was providing as separate layers. Obviously he also added the spaceship rendered by the lighting department and a few lens effects to make the look of the shot more photographic. LV-233 Valley // DMP before compositing. This shot pictures the valley where all the alien “Pyramids” are. The excellent Yannick Bourgie slapped a few elements together for the mountains and the ground, when he had to move away from the task to lead an urgent Comicon teaser for what at that time was a very secret project: “Godzilla“. So I had the luxury to base my work on these well selected raw elements augmenting them with more details, atmospherics a sky and the back lit “gas giant” which is looking like a luminescent ghost appearing through the clouds. Pyramid head // DMP before compositing. A few amazing artist worked on the features of the alien pyramid. They explored many different options for the face and I do remember that at the very beginning they proposed a skull looking face, however the idea was discarded as these sculptures were supposed to represent the look of the “Creators” which is closer to a normal looking human face. So, my colleagues modelled the pyramids with this brief in mind. Once we had to work on this close-up shot the 3D model wasn’t providing the level of fine details that we wanted. 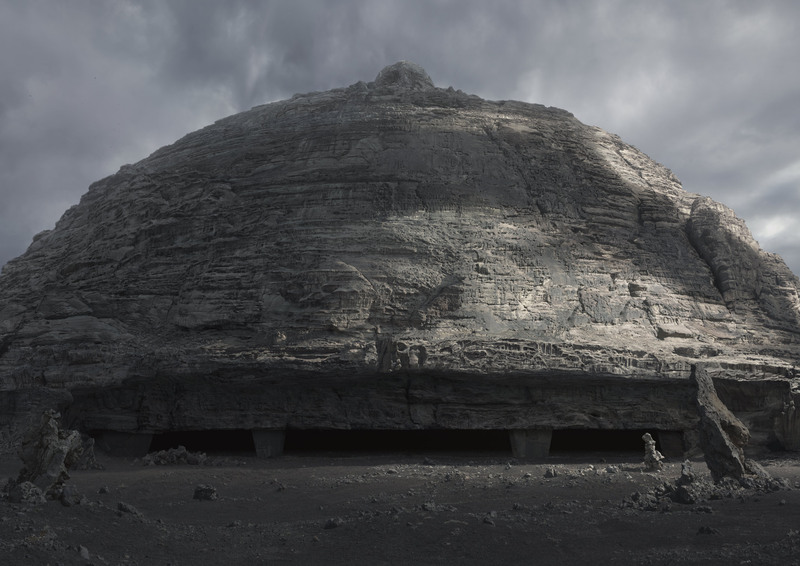 So, I was asked to create a matte painting to render the pyramid in which the Prometheus crew enters. Although we didn’t have much time before the delivery I decided to take the risk and I quickly mocked up a version of the face that was damaged by the extreme planet weather and hence it was looking like a partly decomposed head. In my mind this was a good opportunity to show features (such as the cheek tendon) that could have recalled the original alien xenomorph as an homage to H.R.Giger and the first Alien movie. 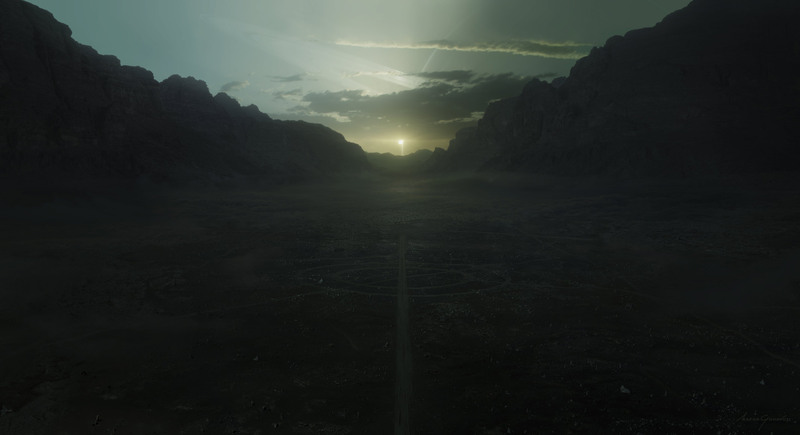 I think that this choice took everyone by surprise but in the end the matte painting was also re-used on another shot so I believe that the rest of the crew in the end agreed and appreciated my idea. 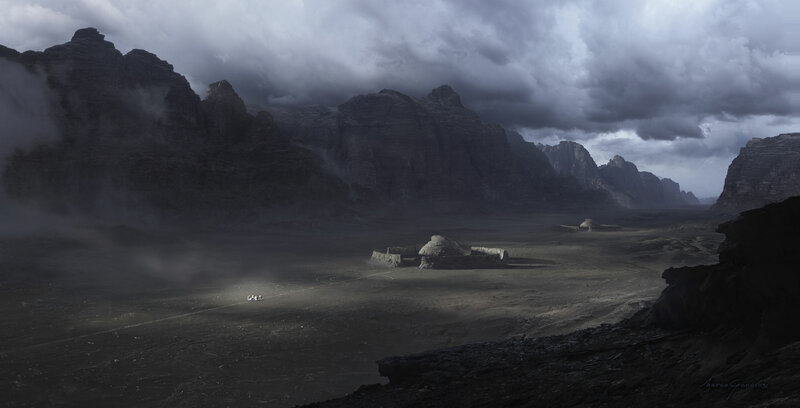 On a technical note I can add that the matte painting was created with and without key-light to allow the compositor to cast the shadow coming from the storm. Pyramid entrance // DMP before projection, rendering and compositing. 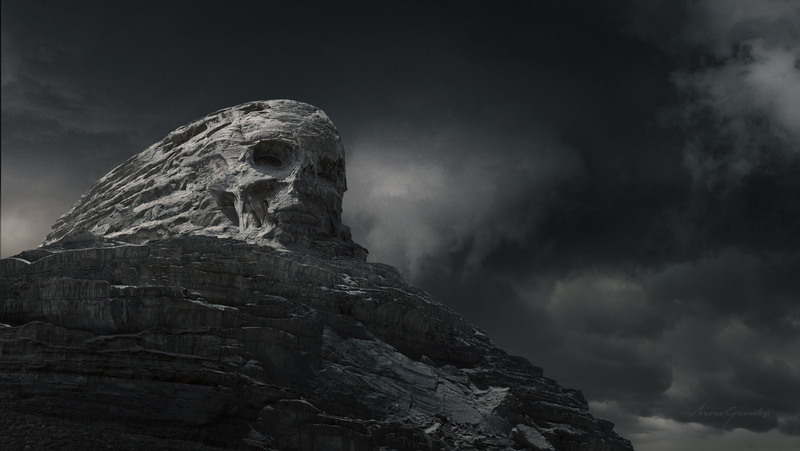 Similarly to the previous shot, we wanted to push the look of the pyramid using a matte painting. So we setup a very wide projection camera and I completely replaced the render with photographic elements. Working on two different versions of the painting (with and without key-light), I was able to provide a slap-comp were the shadow cast by the clouds was running onto surface of the pyramid. Area Valley // One of the first sketches I made to define mood and lighting as well as the relationship between terrain and surrounding mountains. 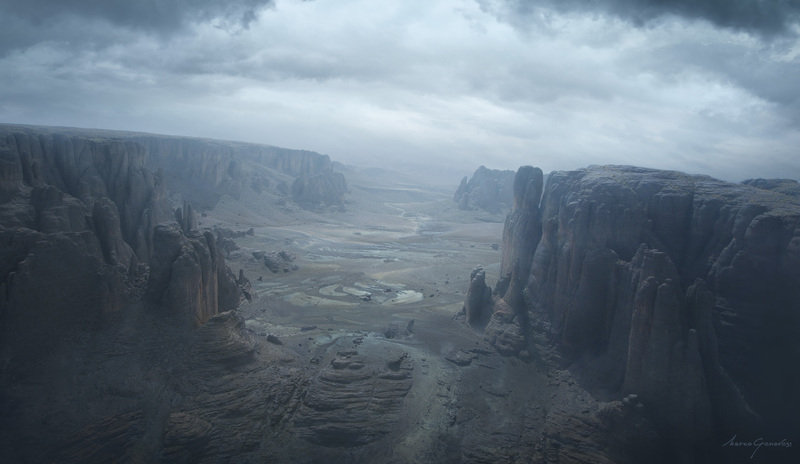 Area Valley // Final DMP before projection and compositing. Although this shot doesn’t really seem challenging it proved to be quite tricky as the original 3D layout was cheating perspective and scale to exactly match a sketch provided by the client. So, after some tests conducted by another artist, the supervisor asked me to jump on it to make it “click” and “feel right”. As it often happens in this kind of scenarios where it’s hard to put your finger on what’s wrong, I decided to de-construct the key elements and rebuild the whole shot from the ground up. At first I focussed on a few different versions of the environment alone to provide options to the supervisor making sure that he could pick a solid basis for perspective, lighting, mood and scale. Only then I introduced the pyramids and the human spaceship Prometheus. The whole process went on with a few iterations but in the end we managed to harmonise all the elements together, without departing too much from the director’s original sketch. Such an amazing, crazy bunch! All copyrighted content belongs to its rightful owners and it is presented on this website only for non commercial use as part of the artist’s portfolio. Any replication, modification, transmission, publication is strictly forbidden prior written consent of the copyright holders.